Solitude Sawmill is a wood mill southwest of Solitude. It consists of a house and a sawmill. 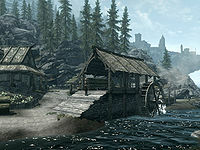 It is owned by Hjorunn, a Nord who employs an Orc named Kharag gro-Shurkul. 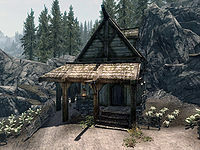 You can sell firewood to Hjorunn, and also buy sawn logsHF here after installing Hearthfire by speaking to Kharag gro-Shurkul. The path leading to the mill has several thistles along it. There are two garden plots containing a total of fifteen leeks and 20 potato plants. Alongside the house are several barrels and sacks all containing foodstuffs, towards the rear of the house are two chicken nests containing eggs. Beside the mill is a grindstone and wood chopping block. Along the shore just downstream of the mill is a second grindstone, two food barrels, a table on which are three leather strips and a woodcutter's axe and a firepit with an empty pot over it. The path continues past this and an iron ore vein a few feet further along, then passes a clay deposit HF to a small damaged jetty where a small boat has been moored. Inside the boat is a potion of minor healing and bucket containing three salmon. A potion of health is on top of a post at the end of the jetty. Upon entering there is a half-height internal wall on your left and two open crates along the northeast wall containing a sample of fly amanita, a gourd, a rock warbler egg, an orange dartwing, four tomatoes, a cabbage and three bulbs of garlic. On the other side of the internal wall is a table holding two potatoes, two pine thrush eggs, a bottle of wine, a baked potato, a raw rabbit leg, a portion of grilled leeks, several loaves of bread, a seared slaughterfish, a salmon steak and several pieces of cheese. Under the table are two open crates containing a sample of fly amanita, a gourd, a rock warbler egg, an orange dartwing, three leeks and two potatoes. Beside the table is a basket containing potatoes and two cabbages. Against the southwest wall is a set of shelves holding several cheese wheels, two loaves of bread, a cabbage and potato. To the right of this is a fireplace with a cooking pot in front. On the hearth is a piece of raw beef and a cabbage in a cast iron pot. There is a second interior wall to the right of the fireplace with a bottle of alto wine and a plate holding a portion of grilled leeks on top. There is a rack holding three garlic braids hanging from the ceiling. Against the northeast wall are the stairs up to the top floor. Under the stairs are a set of shelves holding two potatoes and a cupboard holding a knapsack, an iron mace and a woodcutter's axe. To the left are two barrels and sacks of foodstuffs. In the western corner of the building is a bedroom with a single unowned bed with an end table beside it. 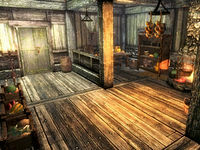 Behind the internal half-height wall beside the fireplace is a table and chairs set for two with a bottle of Nord mead, two portions of grilled leeks, two seared slaughterfish, a loaf of bread, an eidar cheese wedge and a bulb of garlic. At the top of the stairs is a wooden bench, with a table and two chairs to the left, in the western corner. On the table is a loaf of bread and bottle of wine. Above the table is a wall shelf holding three copy of The Firmament. Against the southwest wall is a small unit holding two goblets, a plate, a common book and an unlocked display cabinet containing an iron dagger. Beside the unit is a sack. The top floor only covers half of the building and has a railing around it. In the southern corner is a second single unowned bed with an end table beside it and an unlocked chest at the foot of the bed. The key to the millhouse is carried by Hjorunn and Kharag. Unlike most other houses, it is locked with a novice-level lock during the day, but unlocked at night. Esta página foi modificada pela última vez à(s) 04h26min de 5 de setembro de 2014.